In the middle of the week, I selected another pint to satisfy my thirst and curiosity. I poured out a Paulaner Hefe Weizen. This is the best-selling beer by the Paulaner Brewery, and the use of specially produced top-fermented yeast is what gives the beer its unmistakable taste. I found the cloudy, orange color and fruity aroma to be most appealing. The taste was no less disappointing with a blend of wheat and mild citrus and a slightly bitter finish. The mouth feel was clean and crisp. I would give this an A-. You hit the nail right on the head! This is a really good beer. Even better on tap. It was the first wheat beer that I ever tasted, and to paraphrase Jerry Maguire, “it had me at hello!”. I remember reading the words “banana and clove” when I first read the beer menu at the now defunct Ludwig’s Beer Garten in Philly, and just had to order it. Crisp, clean, and refreshing. A+ on tap, A- in the bottle. I hate to do this, but I’m going to have to downgrade my rating. I had a glass of this beer yesterday at Hofbrau Schmitz on South Street in Philly. 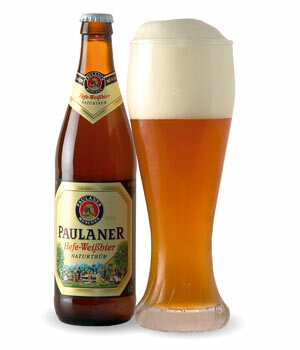 Although it was an exceptional pour (Paulaner glass, creamy head), the flavor was lacking. What happened to that lovely “banana and clove” aroma??? Although I still enjoyed the beer, I didn’t love it. It left me kind of “Eh”. Thankfully, Zie Beer Wench was a welcome distraction. New rating: B.
I was in total agreement with you on your first review. Please don’t change your initial rating! Good beer! This brew review is consistently one of the “most read” posts each day on this blog. If you are reading this leave a comment and tell us why. So true… it’s a complete mystery why this gets so many hits. Not complaining. Just curious is all. Any insights would be greatly appreciated! The reason is people looking up Hefeweizen-pictures and then landing here. And, here all this time, I had thought it was the quality of the review. My allusions of grandeur have been dashed. Let me get this straight… you survived 16+ years of Catholic education, 30ish years of living under Pappy’s roof, 40+ years of The Vipers, 13+ years of marriage, 9+ years of fatherhood, and 5+ years of drinking with The Booze Dancers, and it took just one comment from some guy that we most likely do not not know from some godforsaken part of the world to dash your “delusions of grandeur”??? Does that mean that this random comment was the “straw that broke the camel’s back”? Just curious. I believe I had allusions and not delusions of grandeur. And yes, this was the back breaking straw. I’ve only had this on tap & found it to be awesome.